Is Retaining a Tech Recruitment Agency Right For You? With top candidates staying on the market for 10 days or less, locating and hiring qualified talent is becoming increasingly difficult in the tech industry. Recruiters and hiring managers know the best architects, engineers, and developers are on the market for a matter of hours, not days. Gone are the times of making a hiring decision between top candidates over the course of several weeks or months, leaving employers in need of a fresh approach to traditional hiring methods. In today’s candidate-driven market, having a partner who can represent your brand, speak for your culture, and effectively source hard-to-fill positions is priceless. Enter the value of retained search. Formerly considered only an option for hiring executives, retained search within the technology industry is providing hiring managers the opportunity to focus on their core business objectives while gaining a business partner who delivers quality candidates to the pipeline. Interested in learning more about a retained partnership? Submit your inquiry here for a deeper look. Traditionally, employing a search agency on retainer is utilized to fill high profile, executive-level positions. The tech industry is breaking this mold by expanding it to include all levels of technical roles, from entry level to the C-suite. Companies realize technical engineers, developers, and designers at every level play a significant role in their organization. They’ve seen first-hand the value of swiftly implementing a first-rate candidate and what it can mean for future growth both technically and culturally. Retaining a recruiting firm ensures the same speed and quality you should expect from a contingency-based partnership but takes the level of consultancy one step farther. "Companies are looking for a business partner who can become an extension of the organization. 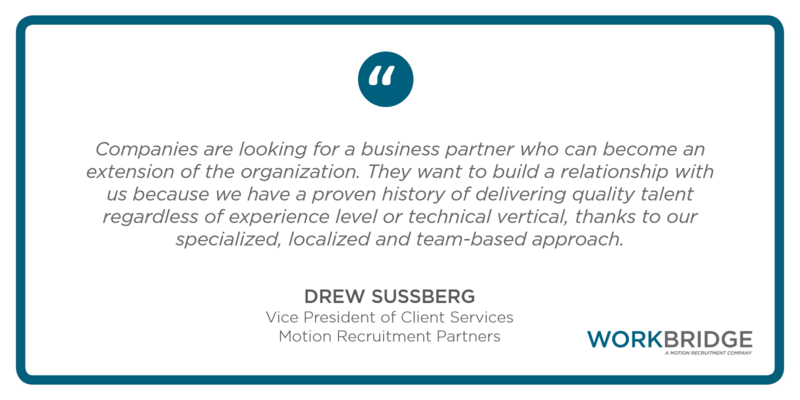 They want to build a relationship with us because we have a proven history of delivering quality talent regardless of experience level or technical vertical, thanks to our specialized, localized, and team-based approach." When companies have exhausted their internal recruiting resources, they often see value in outsourcing hiring for open positions. However, working with multiple recruiting firms can be draining. At best, the phone rings off the hook with recruiters pitching their qualified (or even unqualified) candidates, inboxes overflow with resumes, and the interview process becomes all-consuming until a hire is made. At worst, hiring for open positions cuts into the time spent working on projects, decreasing production-levels and triggering missed deadlines, without yielding a long-term hire. By agreeing to a retainer, companies commit to partnering with one recruiting firm who understands the culture and business needs, which cuts down on the time hiring managers spend reviewing resumes and interviewing mediocre candidates. Most companies task their internal recruitment or procurement teams with finding talent across a wide range of positions while adhering to a strict hiring process and set of internal guidelines. With today’s candidate-driven tech market, those hiring processes will often operate too slowly to secure top tech talent, resulting in the loss of valuable production time as the search continues. 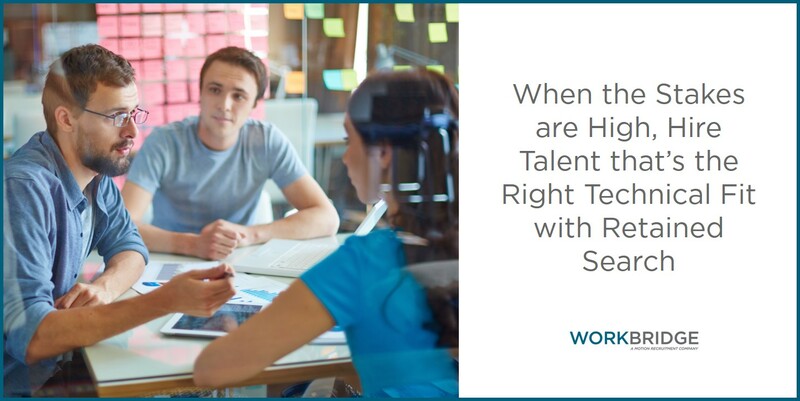 Retaining a personalized hiring consultant takes the guesswork out of the process, making the talent search much more targeted and efficient. A retained recruiting agency is especially valuable when it comes to bulk hiring, for which a search agreement by retainer usually supplies a discounted rate, as an agency partner can fill multiple positions quickly for the company. From engaging candidates with a job opportunity to hiring them, a specialized agency averages 10 days to placement. In turn, companies are less likely to miss out on top talent, which cuts down on revenue lost through the unfilled role. In 2017, unemployment among technology professionals has dropped to 2.5%, and high-demand candidates go off the market in under two weeks. A dedicated recruitment partner has access to engage the higher quality talent whether on or off the market. Passive candidates are unlikely to be exposed to opportunities through job boards and other more traditional recruiting methods. They’re much more likely to find their new role through word-of-mouth or networking, and a specialized recruiting firm engages their expansive network to target them. Retaining a specialized recruitment partner ensures priority with a first look at that qualified talent. This is especially valuable when filling niche, but critical roles. Curious how retained search could help your organization reach its hiring goals? Sign up here for a free consultation. Retained search is revolutionizing the tech staffing industry by building partnerships between recruiting agencies and organizations with sights set toward both short-term and long-term goals. It eliminates much of the risk associated with filling important positions internally because getting it wrong can set a project back months (or longer) and have significant revenue consequences for the business. By retaining a search agency, you gain exclusive access to a large pool of qualified, passive candidates often at a discounted rate. It can be employed for a single placement or a batch of hires and depending on the agreement, can provide a guarantee of service and/or quality. Under a retainer, a recruiting agency becomes an extension of an organization’s hiring arm and can be a powerful and efficient tool ensuring technical hiring needs are met.